This adult Anopheles gambiae mosquito — the kind that spreads malaria — was genetically modified as part of the study. For the first time, scientists have demonstrated that a controversial new kind of genetic engineering can rapidly spread a self-destructive genetic modification through a complex species. The scientists used the revolutionary gene-editing tool known as CRISPR to engineer mosquitoes with a "gene drive," which rapidly transmitted a sterilizing mutation through other members of the mosquito's species. After mosquitoes carrying the mutation were released into cages filled with unmodified mosquitoes in a high-security basement laboratory in London, virtually all of the insects were wiped out, according to a report in Nature Biotechnology. The mosquitoes were created in the hopes of using them as a potent new weapon in the long, frustrating fight against malaria. Malaria remains one of the world's deadliest diseases, killing more than 400,000 people every year, mostly children younger than 5 years old. "We are very excited," says Andrea Crisanti, a professor of molecular parasitology at Imperial College London, who led the research. "This is a game-changer. This is a completely new era in genetics." 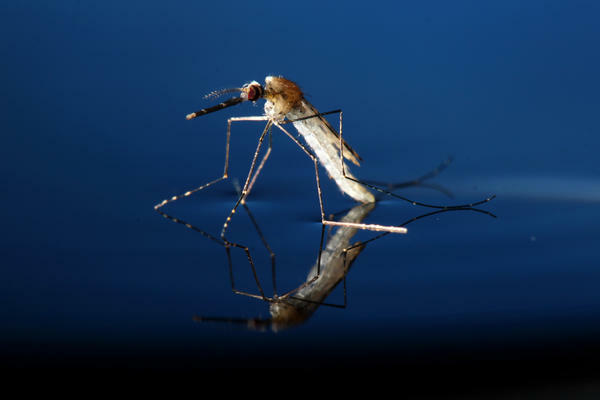 "This is an extraordinary paper," says Kevin Esvelt, an evolutionary engineer at the Massachusetts Institute of Technology and a leading "gene drive" researcher. He was not involved in the new research. "We know what the costs of malaria are — and they are horrific," Esvelt says. "This could save a lot of lives." Crisanti, Esvelt and others are especially encouraged because the mosquitoes did not appear to further mutate in a way that would diminish the effectiveness of the engineered mutation. That has been a major problem plaguing attempts to use gene drives. "This is really exciting work. It's a major development," says Omar Akbari, an assistant professor in the cell and developmental biology section at the University of California, San Diego. But the researchers stressed that many years of additional research are needed to further test the safety and effectiveness of the approach before anyone attempts to release these mosquitoes or any other organisms created this way into the wild. The scientists acknowledge the technology raises serious concerns. So it will require broad political debate, rigorous regulation and the consent of people living in any areas where they might be released, they say. The program sponsoring the research, Target Malaria, has already begun extensive discussions with countries in Africa where the mosquitoes could eventually be released. Nevertheless, there is already intense opposition among some activists. "Africa has become a testing ground for a technology that has not been proven — a technology that no one could say is safe definitively," says Nnimmo Bassey, director of the Health of Mother Earth Foundation, which is based in Nigeria. "We have a problem with this." One major concern is that eradicating or significantly suppressing an entire species could have unpredictable effects on the environment, critics say. "It could lead to ecosystem crashes," says Ricarda Steinbrecher, a biologist who works with the group ECONEXUS. "It could lead to other species coming in to fill a niche that are even more a problem," Steinbrecher says. "It's beyond our ability to predict what the consequences are, except that it could be really devastating." Some worry the approach could be used to create new biological weapons. "The defense industry could deploy this as a weapon for war," says Jim Thomas, co-executive director of the ETC Group, an international technology watchdog. "You could use a gene drive in an insect that could deliver something that is toxic." Crisanti dismisses the notion gene drives could be used to easily create new biological weapons. While he acknowledges the concerns, which have been considered by numerous scientific organizations, Crisanti and others argue the potential benefits far outweigh the risks. "I regard a mosquito that transmits malaria as a pathogen — and as a pathogen we have the right to eliminate it," Crisanti says. "We have eliminated viruses like smallpox. We are trying to eliminate polio. I don't see a big difference." The technology could also be used to target other disease-spreading insects, such as the species of mosquitoes that spread diseases including Zika and dengue. Gene drives could also be used to fight agricultural pests. "It opens a lot of possibilities," Crisanti says. Gene drives are sequences of DNA that defy the usual rules of genetics. They can be passed along to future generations at a far greater rate than occurs naturally. The existence of gene drives has been known for years. But it wasn't until the development of CRISPR that scientists could try to harness their power. CRISPR enables scientists to make very precise changes in DNA much more easily than ever before. The British team used CRISPR to create a gene drive that altered part of a gene known as "doublesex." That gene plays a crucial role in determining whether individual mosquitoes are male or female. Male Anopheles gambiae mosquitoes engineered with the mutation can mate with normal female mosquitoes, passing along the changed gene. Anopheles gambiae mosquitoes are the primary vector responsible for spreading malaria in sub-Saharan Africa. Females with one copy of the mutation also behave normally and are healthy, allowing them to continue to spread the mutation. The experiment showed the mutation was transmitted nearly 100 percent of the time. But female mosquitoes born with two copies of the mutation have characteristics of both males and females that render then incapable of biting — and therefore spreading malaria. They are also incapable of laying eggs. So when the mutation spreads to enough female mosquitoes, populations of the species eventually crash because they can no longer produce offspring, the new research shows. That occurred after seven to 11 generations, which in the lab took only about six months, Crisanti says. The research was funded by several organizations, including the Bill & Melinda Gates Foundation, which also provides support to NPR. Scientists have figured out how to spread a genetic self-destruct switch through a dangerous species - mosquitoes that carry malaria. NPR's Rob Stein reports that the advance is raising hopes and fears. ROB STEIN, BYLINE: Malaria is one of the world's greatest afflictions. And despite decades of fighting the mosquito-borne disease, Andrea Crisanti at Imperial College London says malaria remains a major killer. ANDREA CRISANTI: It still ranks amongst the most frequent diseases in the world. Malaria affects about 200 million every year and kills about 400,000, mainly children below the age of 5. STEIN: So Crisanti's team decided to try something that's never been done before - use a powerful new kind of genetic engineering to modify a mosquito to destroy its own species. CRISANTI: Our idea is to develop a genetic modification that is able to spread generation after generation to the point that all mosquito becomes genetically modified. STEIN: And all the female mosquitoes become mutants. They can't bite or spread malaria and, more importantly, can't lay eggs. So eventually the population dies out. CRISANTI: We go after the mosquito because it's the mosquito that transmit malaria - no mosquito, no malaria. It's a very simple equation. STEIN: Crisanti's team released male mosquitoes carrying this self-destruct gene into cages filled with unmodified mosquitoes. They did it in a high-security basement lab in London to make sure none of the modified mosquitoes escaped. And it worked. The self-destruct mutation spread like crazy and quickly devastated the normal mosquitoes. CRISANTI: Their entire population is wiped out, and they're completely eliminated. STEIN: Crisanti says this shows these modified mosquitoes could be a powerful weapon against malaria and other insect-borne diseases. CRISANTI: We're very excited. This is the first time that using a genetic construct, you can eliminate a dangerous species. This is a real game-changer. KEVIN ESVELT: This is an extraordinary paper. STEIN: That's Kevin Esvelt, an evolutionary engineer at MIT. ESVELT: We know what the costs of malaria are, and they are horrific. If we want to get rid of it entirely, we need some kind of breakthrough. This is a key step. This could save a lot of lives. STEIN: But the idea of letting insects genetically modified like this loose in the world is raising big fears, including among some activists in Africa where the mosquitoes would be released first. Nnimmo Bassey heads the Health of Mother Earth Foundation in Nigeria. NNIMMO BASSEY: It would be that Africa has become a testing ground for a technology that has not been proven, a technology that no one can say is safe definitively. We have a problem with this. STEIN: The biggest fear is that wiping out a species of mosquitoes could wreak havoc with the environment. Ricarda Steinbrecher is a scientist with the group EcoNexus. RICARDA STEINBRECHER: It could lead to ecosystem crashes. It could lead to other species coming in which are even more of a problem. It could have consequences on the whole food chain. It's beyond our ability to predict what the consequences are except that it could be really devastating and problematic. STEIN: Crisanti and others dismiss fears that eliminating one species of mosquito would be a problem when there would still be hundreds of other mosquito species. CRISANTI: We have eliminated viruses like smallpox. We are trying to eliminate polio. I don't see the big difference. I regard a mosquito that transmits malaria as a pathogen. And I think as a pathogen, we have the right to eliminate. STEIN: But Crisanti and other scientists acknowledge more research is needed to prove the technology works and is safe, and a political and social consensus is needed before any organisms genetically engineered this way are ever released into the world. Rob Stein, NPR News. Transcript provided by NPR, Copyright NPR.